The wedding date was set on June 28th, 1969 – the day after Anna finished the school year teaching at Calvin Christian School in Hamilton. Both Anna and Conrad had a spirit of mission and adventure; now they needed a direction. During March Break that year they made up a letter and sent it to 35 different organizations around the world – everything from missions and humanitarian aid groups to government and UN organizations. Of all the letters sent, there was only one favourable response. It was from the Canadian University Service Overseas Committee (CUSO) at the University of Guelph. Three days later the Dean of the Ontario Veterinary College called Conrad with a request from the University of Sierra Leone for a veterinarian to be a lecturer in their Animal Science Department of their Agricultural College. He expressed his interest even though he didn’t have a clue where Sierra Leone was. After a whirlwind meeting and approval process, the now married couple arrived at Njala University College in Sierra Leone in September of 1969. They quickly got to work: Conrad as lecturer in the Animal Science Department and Anna as sixth grade teacher in the University’s Experimental (primary grades), which was also training for teachers. The following two years were very fulfilling. Their dream of helping in a Third World Country had been met, and now they wanted to make a career of it. The Lord, however, seemed to have different ideas because this would end up being delayed for more than 30 years. When they arrived back in Canada in 1971, Conrad completed a year of graduate studies at the Ontario Veterinary College, specializing in poultry since he felt that this would benefit developing countries most. Despite it being difficult to find a supporting organization, Conrad went back to Sierra Leone twice during the 1970’s on advisory trips, spending 6 months in Bangladesh. After that he settled in a Poultry Veterinary Practice in Stratford, Ontario until 1995. Five years later they moved to Newfoundland. Their dormant but not forgotten dream was suddenly renewed during a mission trip to China and Indonesia. In 2001 they met journalist Alpha Abu who asked them to help him return to Sierra Leone, which had just gone through a devastating 10-year civil war. A Sierra Leone Help committee was formed and money was raised to send Alpha back in April 2002. By divine coincidence, Conrad was asked to join a mission trip to neighbouring Ghana in August 2002 allowing him to add a one-week stay in Sierra Leone. After visiting an orphanage during this week stopover he felt a strong call to help overcome systemic poverty in Sierra Leone. Using his expertise in poultry, in 2003 he started a project to help subsistence farmers purchase and raise chickens. Thus, Hope For Sierra Leone was born. For the next seven years this project saw great success, improving the farmers’ income. But there was one problem: due to the farmers’ survival mindset – always paying their most urgent bills and not being able to plan ahead – they couldn’t invest their profits into purchasing replacement chickens. It was around this time that Conrad started learning about principles of transformation from a variety of sources – conferences, journal articles and meeting key people. He began to understand new paradigms, starting with Spiritual Capital (integrity, honesty, excellence, etc. ), the importance of people’s worldview and became exposed to Transformation Programs headed up by Dr. Ed Silvoso. As Conrad and Anna learned more, they both became part of Transformation Canada, especially in Hamilton where they had relocated years previously. From 2003 to 2014, Conrad had been visiting Sierra Leone about three times per year. 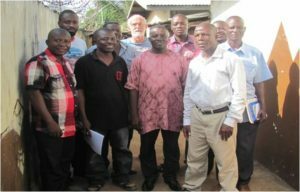 Equipped with this new thinking, he hosted a Transformation workshop for local Christian leaders on his next trip and they immediately formed Transformation Sierra Leone (TSL). As they learned about transformation they in turn gave workshops to others and the result of their unity and vision it to launch a National Transformation Program in 2017. The journey has not been without great difficulty and loss. When the Ebola outbreak hit Sierra Leone in 2014 Conrad was only able to visit the country once. In February of 2015 Conrad decided he needed to go to Sierra Leone to assess the situation and see if there was any way could help. On the way to the airport in Toronto he was in a terrible car accident in which Anna was killed. Conrad was seriously injured and spent more than two months in the hospital and several more recovering. It was a sudden and devastating blow, but this experience has given him a better understanding grief, which many Sierra Leoneans suffer as their life expectancy is only around 40 years of age. Thanks be to God, that was not the end of the story. Just this year the Hope For Sierra Leone team received two exciting stories of transformation. Teams have been helping quarantined Ebola families when they were turned away by family members who wouldn’t shelter them due to fear of catching the disease. As a result of their efforts more than half of Wongotown, a Muslim community of about 2000 people, gave their hearts to the Lord. In another such community, Rogbangba, 15 new churches have been created because so many are coming to Christ. We are so thankful for the Lord leading our work in Sierra Leone and how He is adding to His Kingdom.